...and she comes home on Saturday morning! OK, so it was only barely Saturday morning (12.30am) but I've always wanted to make a reference to that song. Luckily, my night was a lot nicer than the one related in the lyrics! My friend Jacoba and I started the night at the Chocolate Bean with flavoured icies (she had orange, I had rose, which is divine) and then headed down to Cushdy for the Lindy Lounge (a social dance night). It was such a fun night. I only had one dance but just being there and actually talking to people was wonderful. Outfit details: hair flowers - discount store; faux pearls - Mum's; dress - Salvos; gloves - Goodwill; stockings - stockingshq.com; shoes - SpendLess. Outfit details: necklace - Fisherman's Wharf markets; dress - church op-shop; stockings - stockingshq.com; shoes - Big W.
I hope everyone is having a relaxing and fun weekend! You looked lovely in the polka dot dress, especially those flowers in your hair. I just adore your hair!!!! Is that really late for you to come home at 12.30 am? Maybe it's a cultural difference but here in scandinavia bars usually close at 2 or 3 am, and it's normal to continue the partying at someone's house. I know that wasn't the point of your text, just caught my attention. Anyway, I do love your style! where do you buy your rats? Andi, you lookstunning in these two outfits ! Hope you had a great evening ! You look great! 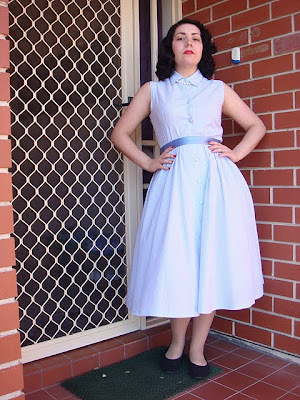 I adore the blue dress, I really want to find something that looks as 'girl next door' as that dress does! love Love LOVE the hair! 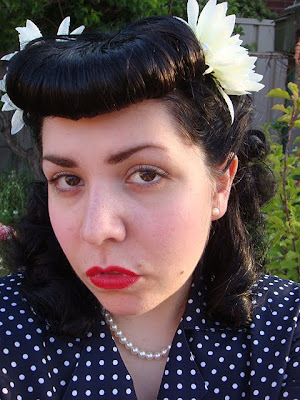 I've got to find some vintage hair tutorials. My husband saw me reading this post just now and thought it was me on the first photo LOL. Anyway, you look stunning as always, great finds! Both outfits are deeply wonderful! Please add another hair compliment to the pile, for I think it looks absolutely amazing! Thank you dearly for your wonderful comments! I hope you're having an awesome week!